Last night I had a dream of a polar bear looking deeply into my eyes. There was no aggression or fear attached to the dream. The polar bear gave me the impression it was trying to communicate something very important, but all I could focus on was the fact that I was looking at a polar bear. I’ve had previous dreams of black bears mainly because of an encounter with one as a young adult, and as a child I had several dreams of a brown bear chasing me. On the advice of my mother, I made friends with it and the dreams stopped. Otherwise my bear dreams have been mostly positive. I was told that dreams of bears may represent our need to attune ourselves with the energies of the earth, helping us heal the imbalances within our bodies and spirit. To look within ourselves for the answers we seek and embrace the cycle of life, death and renewal, which is easier said than done. 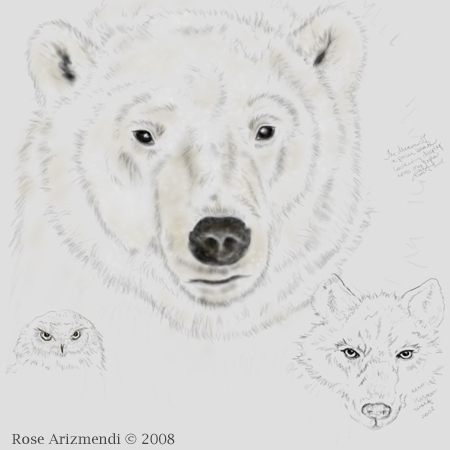 Here is a sketch of the polar bear from my dream. 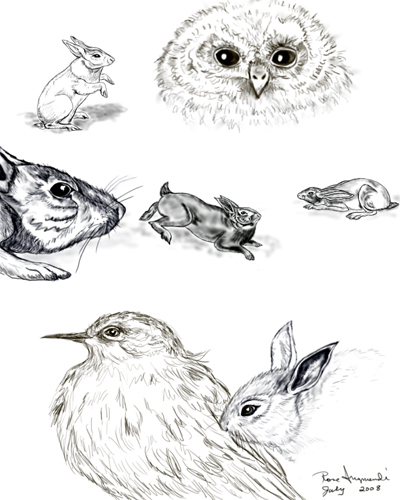 Started the day with sketching a few rabbits, an owl and a bird. I always had an affinity with rabbits since my childhood. As a child growing up in Texas, we had cottontails and jackrabbits as pets. Spring plowing always resulted in grandpa bringing baby rabbits home which mom fed and nurtured until they could be released back into the wild. However many of these furry friends decided to stay around for awhile, so our dad and grandfather built nice wood rabbit hutches with screened-in sides for all of them. I began my love affair with owls many years ago when I was a child. 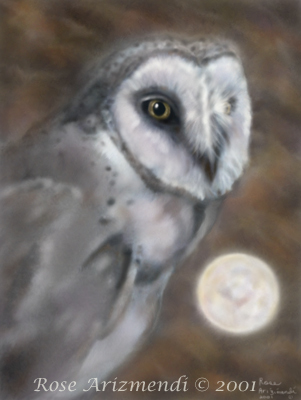 Over the years I have collected, sketched and painted owls. Recently, my neighbor passed away. She was 101 years old and also happened to be an avid collector of owls. I was pleasantly surprised to find out she was a fellow owl lover. We will miss you Pauline. Thank you for all those wonderful conversations over the garden fence.